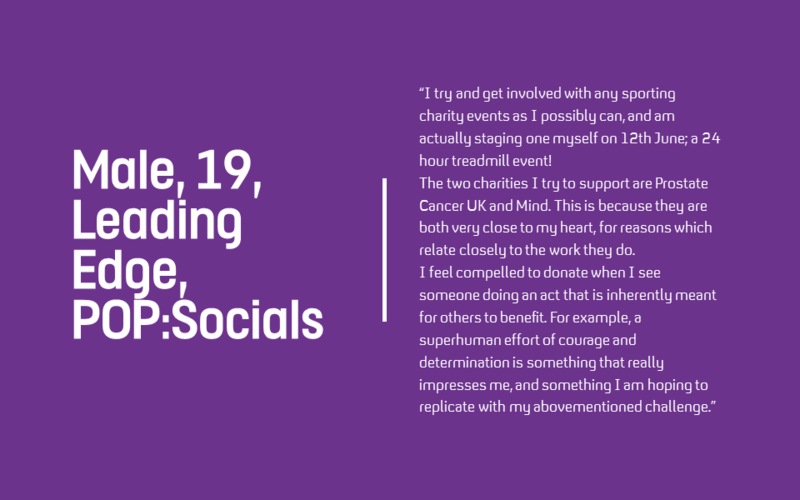 Since the last UK Tribes charity report in 2014, notable differences can be seen in young people’s views and attitudes towards charities, where they show a strong awareness of how the sector operates and make considered choices. 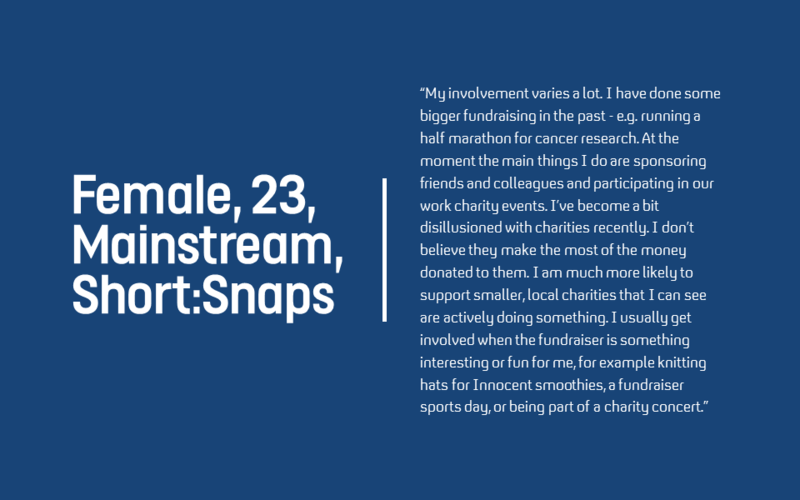 One of the most prominent values of 16 to 24-year-olds is their genuine desire to make a difference; from donating to Macmillan, running half marathons for local charities, sponsoring friends and colleagues, hosting cake sales to knitting hats for Age UK. Through collective and active participation, Tribes believe that charities have an important role to play in helping those in need. Tribes value experiences and derive a great sense of satisfaction from more active forms of participation that tap into their need for affiliation and belonging. The act of giving becomes a social act where friends, family and colleagues influence and motivate each other to give back to a cause that is generally done in the context of schools and work settings. Individual contributions can go a long way, hence donations through fundraisers being a popular mode of charitable giving. The more fun and creative Tribes can be in the process of their donation, the more memorable and positive experience they have, leaving Tribes with a good impression of the charity. Charities that use ‘guilt trip tactics ’ or communications that are antiquated can fail to capture Tribes’ attention. 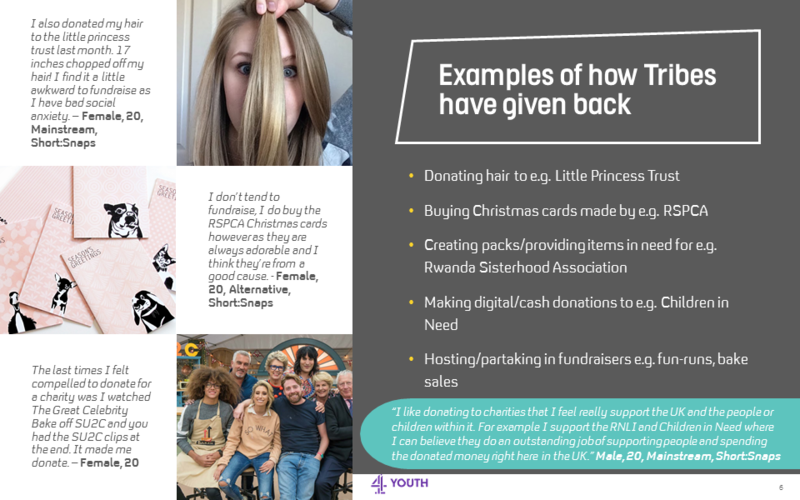 For example, young adults will sometimes question a charity’s motive to help people in third world countries when using communications along the lines of ‘save people in Africa’. They are more inclined to donate when they are inspired by a story that feels authentic e.g. Celebrity British Bake Off, which compelled a few Tribes to donate towards Stand Up 2 Cancer after they saw inspirational clips. In recent times, a number of scandals have appeared in mainstream media and damaged the reputation of notable charities such as Oxfam and Red Cross. Some Tribes have become disillusioned with charities who are felt to have abused the public’s goodwill, and as a result generated a lack of trust in the charity sector. Tribes feel deterred by emotive charity advertising where tactics used to shock or guilt-trip prove to be ineffective and instil a feeling of helplessness rather than a call-for-action. However, this does not stop Tribes from giving back; it compels them to do more research so they can make informed decisions. 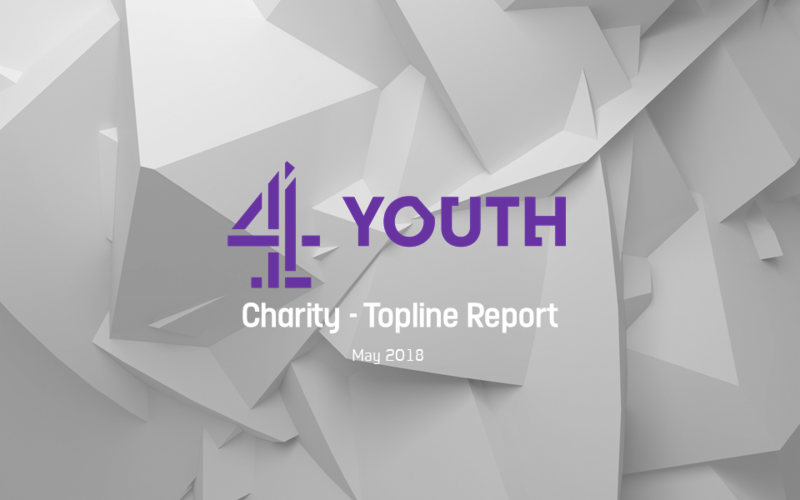 In a recent survey conducted by the Charity Commission with a sample of 2000 people, they found over half of young people said that they usually do checks on a charity before donating to them, compared with just 29% of over 75s (The Charity Commission, Dec 2017). There is a greater preference to give back to local charities and give back towards a cause Tribes feel an affinity with e.g. one of our Tribes lost both his parents to cancer and continues to support Cancer Research as a result. Their collective community consciousness means that Tribes enjoy helping out their local communities and issues that are of a wider concern; they want to see where their money is going and how it is being spent. A minority of Tribes commented on the importance of donations and public support being used to transform public spaces and communities within their area. They’re aware that a proportion of funds go towards charity staff salaries and administration costs, but feel that local level support and volunteering plays an equally important role where results are more tangible. what does this mean for charities moving forward? Keep the messaging and overall tone positive and clear; Tribes are sensitive to different types of communication and want to see messages that make them feel inspired and empowered to give back.